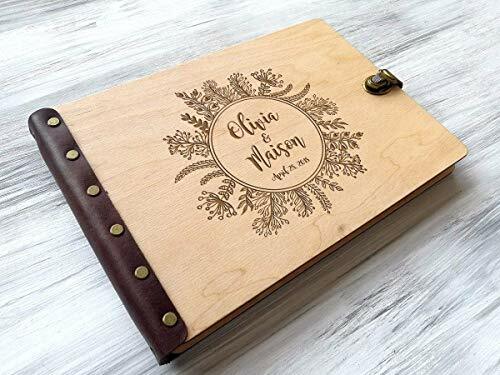 It's a beautiful Wreath Wedding Photo Album Wreath made of wood and leather that will accurately keep your memories about this special day. And years after you'll look through it and your memory will fly you back to such a happy day. Custom Engraved Photo Album can be an excellent gift for couple as beach wedding gift, engagement gift or wedding anniversary gift. Newlyweds will appreciate such special attribute of their wedding day. You can use wooden Photo Album even as birthday present to keep all memories in one place. Customization: We can engrave any kind of picture or inscription, just let us know! To album also attached Photo Corners - 300 pcs. The production takes 1-3 business days. It takes at least 8-18 business days for a package to arrive to Europe (to Italy, Spain, Ireland it takes more), 8-25 business days to USA, 14-35 business days to Latin America, the Caribbean and Asia, Canada, Australia, New Zealand. IMPORTANT!!! These terms are provided by the postal services and we are CANNOT BE GUARANTEED that the parcel will arrive at this time. For international orders, once the ordered item has left the Ukraine, we can't guarantee delivery. This is subject to your local post office. Please, pay attention that during Christmas and other holidays, the delivery time can be increased by 7-14 days. If your parcel is returned because of incorrect information about the address or if you forgot to receive it, you will need to pay the shipping cost again. If you have any questions about this product by WoodPresentStudio, contact us by completing and submitting the form below. If you are looking for a specif part number, please include it with your message.